Edward C. Jordan was born in Edmonton, Alberta, Canada, on December 31, 1910. He received the BS degree in 1934 and MS degree in 1936 from the University of Alberta, and the PhD degree at The Ohio State University in 1940. Upon completing his doctoral degree, he served one year as instructor at Worcester Polytechnic Institute. He returned to Ohio State University in 1941, where he was an instructor, assistant professor, and consultant to the Antenna Laboratory from 1941 to 1945. In 1945, he followed his mentor, William L. Everitt, to the University of Illinois. 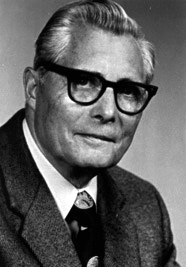 At the University of Illinois, Dr. Jordan served as associate professor from 1945 to 1947, professor from 1947 to 1979, director of the Radio Direction Finding Laboratory from 1946 to 1954, and director of the Antenna Laboratory from 1950 to 1954. In 1954, he was named Head of the Department of Electrical Engineering, in which capacity he served for 25 years until his retirement in 1979. Ed Jordan authored or edited nine books and published numerous technical articles. His popular textbook, Electromagnetic Waves and Radiating Systems, was first published in 1950 by Prentice-Hall. A second edition, co-authored with K.G. Blamain, was published in 1968. At the time of his death, he was editing the eighth edition of Reference Data for Engineers: Radio Electronics, Computers, and Communications for Howard W. Sams & Co., Inc., publishers. Jordan received many honors in his career. He was elected to the National Academy of Engineering and a fellow of the Institute of Electrical and Electronics Engineers (IEEE). He received the prestigious IEEE Education Medal and the Stanley H. Pierce Award at the University of Illinois at Urbana-Champaign. He also received the Alumni Honor Award for Distinguished Service in Engineering 1986 from the UIUC College of Engineering, the George Sinclair Award from Ohio State University in 1988, and the Professional Achievement Award from the University of Alberta in 1988. Edward C. Jordan passed away on October 18, 1991.